This statement on the current situation was issued at the end of the two day National Meeting at Pune on 1st & 2nd October. The meeting was attended by key comrades from three functioning branches of New Socialist Alternative (CWI-India) active in Bangalore, Chennai & Pune. Comrades from the International Secretariat, CWI-Sri Lanka and CWI-Malaysia also participated in the meeting. India for long considered as something of a hinterland, surviving on its own, untouched by the vagaries of world market and the global economy, is no longer the case since the advent and aggressive pursuit of neo-liberalism increasingly from in 1991. It was not out of choice but out of dire situation and compulsion, that the hitherto Indian ruling classes who took pride in protectionism in the name of self-reliance and Swadeshi (Local Goods), had to hurriedly change course by opening up the economy for foreign capital. It is no secret that during the early nineties, India’s State treasury was near bankrupt, by the end of 1990’s, it was in a serious economic crisis. The government was close to defaulting on balance of payments, Reserve Bank of India had refused new credit and foreign exchange reserves had been reduced to such a point that India could barely finance three weeks’ worth of imports which led the Indian government to airlift 67 tons of India’s gold reserves as collateral as a pledge to the International Monetary Fund (IMF) in exchange for a emergency loan of $2.2 billion to cover balance of payment debts. The economic liberalisation, which is nothing but aggressive plunder of resources and driving down of the living standards of people by cuts and austerity measures,and to transfer the burden of the capitalist crisis on to the backs of the poor working masses, in a nut shell; POOR PAYING FOR THE MAINTENANCE OF THE RICH. This is exactly the same bitter medicine, which was peddled as the panache cure for all the economic and social evils around the world, be it Asia, Africa or Latin America, and in recent times even in the advanced industrial economies of Europe, which we have witnessed in the crisis surrounding Greece recently. Though the level of integration of Indian Economy and the Market into the world is slow compared to China, nevertheless, the caving-in of the Indian bourgeoisie before the plundering finance capital from the west is phenomenal. While the Chinese hybrid system of “Communist” (Chinese Stalinism) State Control with free market Capitalism, which based itself on the robust infrastructure and manufacturing, and could bargain effectively with the Western Capitalist Powers for their share of the world market, and could in effect penetrate and “dump” their goods. The Indian capitalist class irrespective of the shade of the parliamentary parties, be it UPA-1, UPA-2 or NDA-1 and now the NDA under Narendra Modi have all slavishly succumbed to the diktats of the IMF, World Bank & WTO. As the mandarins of the market claim that India has grown, and quote the success figures of GDP and crow about the development, it is now very clear that it is only a tiny section of India’s burgeoning population of 1.25 Billion, numbering few hundred thousands that has creamed off the benefits of Economic Reforms and the Growth of India’s Economy. A recent Wealth X report said the number of dollar millionaires in India in 2014 rose to 2.5 lakh from 1.96 lakh in 2013, an increase of 27 per cent. The report also predicted that India will have 4.37 lakh millionaires by 2018, and potentially double that number by 2023. India had the 14th largest millionaire population in the world in 2013-14, with the U.S., Japan, China and the U.K. leading the pack. However, other reports show that India does far better when it comes to ultra high net worth (UHNW) individuals — those with a net worth of more than $30 million. Apart from highlighting the growing affluence of the ultra-rich in India, these numbers, when combined with data on per capita income and the findings of the recently-released Socio Economic and Caste Census (SECC) in India, underscore the stark inequality prevalent in India. The World Bank’s most recent data show that India’s gross national income per person rose to $1,610 (around Rs. 1 lakh) a year during 2014 from $1,560 the previous year. This was likely driven by the increase in wealth of a few individuals rather than an overall increase in income levels. While the number of millionaires increased steadily, the SECC found that most of rural India still languished in poverty — the highest paid member of 74.5 per cent of rural households in India earned less than Rs. 5,000 (around $79) per month. On an average, compared 1975-1979, a rural Indian now consumes, 55o fewer calories. Children below the age of three are consuming, on an average , 80 ml of milk per day instead of the 300 ml bare minimum they require. Hence it is no surprise, that 35% of rural men and 42% of women are undernourished and underweight. While the bourgeoisie wants the world only to know the Macro Success stories of the rich found in Forbes list of Billionaires since the 1990’s, the harsh realities of life endured by the masses is a conveniently forgotten chapter. While it is tom-tom’d that India survived the recession of 2008, and the economic crisis that affected most of the world, but what is not well known, is the fact that over the same period 25 years of liberalised more and more Indians, especially in rural India were eating less and less. The much hyped Gujarat model, has become a talking point of the rich for some time now. One study found that the majority of the tax subsidies, given to the investors, was grabbed by large business houses. Thus, the main beneficiaries of this largesse are the already-rich companies. The small and medium enterprises, which generated most jobs, and which needed these incentives more than their large compatriots, were usually left in the lurch. This logically increased the gap between the large and the small; the latter could never aspire to become bigger. Of course, a few of the smaller players could find a ‘political’ way to enter the ‘subsidy club’. Obviously, this club of sops is quite exclusive. It is difficult to join it, but once a business group entered it, it continued to get higher incentives with each new project. In a sense, it was a form of crony capitalism, where limited number of business owners got the maximum amount of state subsidies. But to ensure transparency, and curb outward and visible corruption, Modi democratised the process in Gujarat. Every member of the ‘subsidy club’ received almost similar sops. The concept of wooing business investors through subsidies in the form of taxes that they do not pay for several years goes contrary to Modi’s reforms vision to slash subsidies that go to the poor people. Diesel is deregulated so that the farmers pay the market prices. LPG cylinder prices are sought to be pegged to international rates. While the Minimum support prices for food crops is derided and argued as not the right way to help the farmers. However, the only way to get higher growth and better development is to give ever-higher and ever-expanding incentives to rich industrialists. A more recognisable “middle class” would be the households identified as “affluent” with incomes more than twice the Indian median. These households are hardly well-off by OECD [i.e., developed country] standards but comfortable in the Indian context. Most of these households are based on income from relatively secure, salaried positions, and most own or aspire to an array of consumer goods that make them targets for modern marketing. The real condition of households at the middle of India’s income distribution is brought out by the “multidimensional poverty index”, which measures deprivation in various elementary needs (education, health, and living standards): 55.3% of Indians were deemed to be “MPI poor” in 2005. Another 18.2% were considered to be “near multidimensional poverty.” In brief, if we were to define India’s “middle class” in relative terms, it would be difficult to separate it from the poor. The National Commission for Enterprises in the Unorganised Sector (NCEUS) found that this segment of “poor and vulnerable” included 77% of the population. It termed the segment just above this, i.e., those whose consumption level was two to four times the official poverty line, “middle income.” The average per capita consumption expenditure of this group, which made up 19.3% of the population, was just Rs .37 per day in 2004-’05. The last group, which the NCEUS termed “high income”, constituted 4% per cent of the population, and had an average consumption of Rs 93 per day in 2004-’05. 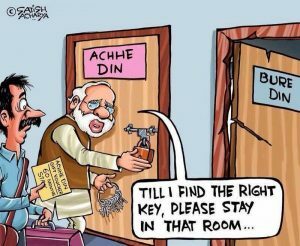 The two and half years of Modi’s regime, which came to power on this “aspirational” Middle classes, has run off steam within this very short space of time. In the run up to the parliamentary elections, the BJP and personally put up a shrill campaign promising the Achhe Din (Good Days) to the extent of even of a promise of Rs.15 lakh into each of the bank accounts of vast Indian population. This was to create a false impression of fighting against corruption and bringing back the siphoned off funds stashed in offshore accounts. Currently, the Modi regime is increasingly exposed, and even sections of BJP supporters are coming to terms with the harsh realities, and feel cheated. But is to be qualified here, that the reactionary Hindutva dividend that Modi & hard-line BJP continuous to bank upon is still out there in abundance. Since the fundamental class issues on which the “party with a difference” has completely failed and stands exposed, it is using its time tested method; communalism which has given them proven results. The controversy over Beef, whipping up anti Muslim, anti Dalit and anti Christian sentiments though has boomeranged to a significant effect, nevertheless it has become a very combustible issue in the recent period. Though the BJP/RSS satraps have cunningly kept silent on the issue, saying they are just executing the constitutional obligation in various states (23 out of 29), where ‘Cow Slaughter Ban’ clauses have been brought in by non-BJP parties in power including the Congress party. Now it is more than evident that the RSS and its parliamentary wing; BJP have a sinister plan of artificially imposing a pan Indian “unitary national identity”, a majoritarian concept on the basis of Hindu religion, which is infamously called as ”Hindutva”. But a heap of faeces can not change its revolting smell or obnoxious character, just because you spray it with a perfume or give a camouflaging name. Hindutva is essentially a feudal social order based on the concept of brutal Bramhinical supremacy, which has been lapped up by the ruling classes of India in an opportunistic manner, and their lies the utter incapacity of Capitalism in India to do away with the feudal or even pre-feudal practices. National integration, it is easier said than done, in a landmass such as India, which is a ‘prison house of nations’ with innumerable languages, national aspirations and identities. Though not classically considered as something of a ‘nationality’ as such, the very failure of the Indian ruling classes to develop the society and take it forward, to day you have number of new questions such as caste and regional disparities flying in the face of the capitalists and threatening the very edifice of a “united nation”. While the atrocities and despicable discrimination of Dalits and Adivasis have existed and abated ruthlessly for centuries, but under the regime of Modi’s Hindutva plank, the dynamics of this feudal social relic has gained a new momentum. What a modern nation needs to shed and cleanse itself in the first available opportunity, is but sustained and brought back with authority giving it the tag of “Indian Culture”. The big business on it part is exploiting these divisions in the society to its advantage, and has put its weight behind Modi, and heralded him as the messiah of development. It is no coincidence or accident, that the recently “evicted” (though not officially) RBI chief spoke about the dangers of riding on the Tiger of Communalism, which polarises the communities as warring factions. Even the flicker of hope, of ruling classes facing up to the challenge of uniting the country on a truly secular, democratic basis to create a robust and profitable domestic market has increasingly dimmed over the decades. Even serious bourgeois commentators in India, representing many Business houses, through their publications such as ‘Business Standard’ have expressed their disappointment over their “dream boy” Modi too, not doing the job effectively and speedily enough for them. As formulated in the very first paragraph, that for decades there existed a mystique around the character of Indian polity and state, that it escaped all analytical parameters, the bourgeois used very cleverly the legacy of anti-imperialist sentiments in the region, camouflaged their plunder under the banner of pseudo “socialism”. They kept the divisions based on religion and caste system intact, and in fact rode on those chasms to continue their rule. They just paid lip sympathy and tinkered with pro-poor policies which hardly reached the poorest of the poor. Now the Indian society is in flux, while the big business feels that it has arrived on the scene and is in charge. Modi with his aggressive no holds barred attitude to trade and commerce has bolstered this long dreamt situation of theirs. But as we Marxists have argued in the past, Indian Capitalism is not only weak in the global context, but it is also extremely late in its arrival. Both Modi’s administration and the native Capitalism (however weak) base their entire bet on what they call “demographic dividend”, i.e. the vast army of unemployed youth as the fuel for growth, based on Poverty or Starvation wages. But there lies the water loo scene, which can shatter all the predictions of the ruling classes. 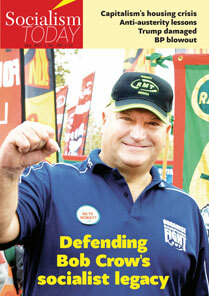 The recent tumultuous events involving the organised working class coming out on General Strikes, Shut Downs, Bandhs and long marches demanding better wages and conditions and resisting the attempts of the bosses to bring in further cuts and aggressive austerity measures. 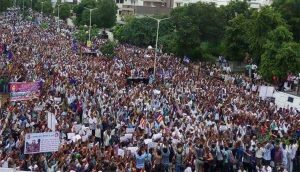 Dalit youth arriving on to the arena of struggle with class demands, has shaken the establishment of Modi to its roots. The hitherto docile movement of the Dalit, Adivasi and religious minorities, which concentrated on the improvement of their Social Position, have for the first time articulated materialist and class demands. Right from the period of protests surrounding the Rohit Vemula’s Murder by Suicide to the assertive Dalit movement demanding Land, after the Una flogging episode, the movement of the Dalit Youth has gone beyond the usual parameters, and has begun to challenge the very traditional structures of India’s rulers, who for a long time hid behind and took shelter under the umbrella of its Constitution’s mere phraseology of “Secular,Democratic and Socialist”. To shrug-off the stuck image of being a virulent right-wing proponent and to paint himself as a moderate and a modern democrat, Modi in the first few weeks and months since ascending to power in the year 2014, dabbled with Statesmanship and Diplomacy with innumerable foreign junkets. To a great extent he was successful in inviting Foreign Investments. But the very domestic compulsions and the crisis that the regime in various sectors is facing is increasingly pushing the Indian State under Modi to take the the mask off its face. 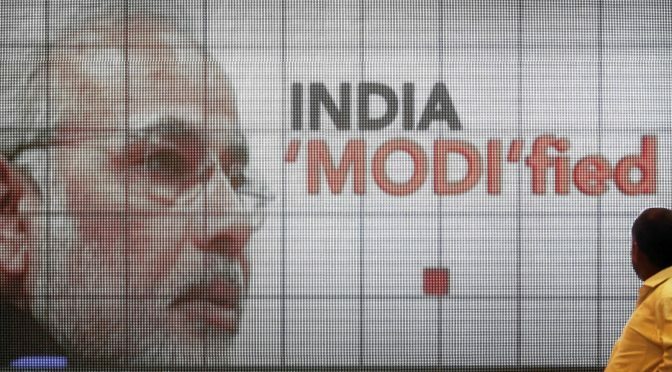 From the controversy surrounding the Nepal blockade to bring them in line with India’s Capitalist interests, the proclamation of Modi on the issue of Human Rights violations in Baluchistan, the surprisingly big financial package promise to Afghan regime, the approving nod to Sri Lanka’s new regime under Mythri and Ranil to continue to deny the Tamils in the North the basic Democratic rights has for the first time made an open face of the hitherto hidden sub-imperialst or regional imperialist intentions of Indian capitalist class. The extreme case of its desperation to spice up its sagging domestic image is the recent sabre rattling which resulted in the “surgical strike’ in the Pakistan territory. This departure from long held tenuous policy of ‘Back room Diplomacy’, has serious implications for the entire region, especially with the stock pile of Nuclear Arms in both countries. It is in this extremely tumultuous and potently dangerous situation that the Indian Marxists under the banner of the Committee for a Workers’ International (CWI) have to wade through. The new uprising and the awakening of the most oppressed sections of the working class; the Dalits, both the organised and non unionised (predominantly women) coming to participate in the unprecedented 180 million strong General Strike on September 2nd, one could see the change in the objective situation, this provides enormous opportunities for the organisation of New Socialist Alternative to spread its ideas and build the party organisation on a firm footing. Though the forces under the New Socialist Alternative banner are very small in number, but they are steeled and trained in the correct analysis and perspectives, a much bolder and audacious approach to seize every opportunity could see the organisation go from strength to strength in the very near future.